This is one of the most elegant barstools on which to perch in Rome. Great lighting, terrific snacks from the kitchen and usually a star spotting keep me going back again and again. Tuesday through Saturday you can feel like you are in New York borough hipster heaven at the groovy Barnum Cafe near Campo di Fiori. The bartenders here really know their stuff with your drink often accompanied by a cocktail history lesson. A bar stocked with unusual spirits and bitters mean even your most obscure request can probably be met. Gleaming subway tiled walls and sparkly chandeliers give a french vibe to this open all day spot near the Colosseum. When the sun sets, the mixologists arrive with their own concoctions of bitters and infused spirits. I liked my violet martini that was like a very grownup roll of Smarties. You have to love a place that has something named the breakfast martini on the cocktail menu. Practically at my front door, we stop here on our way to dinner, after dinner, sometimes we just stay for dinner. An ever changing wine list of reds, whites and sparkling wine mean you will rarely try the same thing twice here. There is also a small menu of Italian craft beers and one of the best aperitvo buffets in Rome. Vine covered buldings and tiny tables on cobblestone streets make this the most atmospheric spot for a cold prosecco break during a wander in the center. In winter, the cozy, marble and wood filled space feels like a trip to Paris. 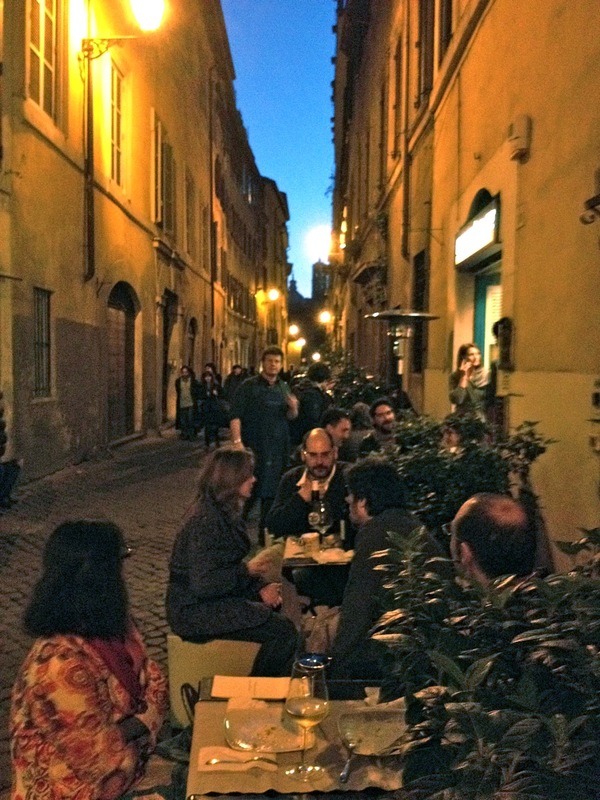 You can find other spots I love for a cocktail here and all kinds of cocktail info in my App Rome for Expats.